Riders enjoy unprecedented convenience, quality and functionality with this innovative line of quick release windshields, available in four sizes. SwitchBlade® Windshields utilize our SwitchBlade Mounting System, which lets riders install, switch, or remove their windshield in less than 5 seconds – with no tools! Switch styles... Switch attitudes... with SwitchBlade! * Some 1987 XL and FX models may also have 39mm fork tubes. Check fork diameter before ordering. 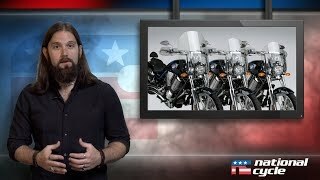 ** Will not work with H-D Light Bars nor with aftermarket light bars. *** KIT-Q344-001 is chrome plated; KIT-Q344-002 is black powdercoated. Check your specific make/model in the SHOP main menu for Holdster™ and Windshield Storage Bag applications. All SwitchBlade® Windshields require a SwitchBlade Mount Kit, sold separately. Windscreens are measured vertically from the top of the screen to the bottom center point. All widths are measured in a straight horizontal line across the back of the screen at its widest point. One Mount Kit... Four Windshields! 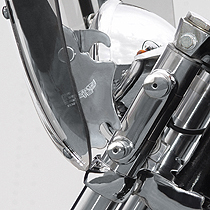 The SwitchBlade® Quick Release Mounting System gives you the flexibility to mount any one of four styles of SwitchBlade Windshields to your motorcycle with ONE Mount Kit. On and Off in Less Than Five Seconds... Without Tools! We know first-hand how windshield requirements may change during the season or from ride to ride. It makes good sense to design a hardware system that allows a rider to easily change windshields. Now you can change windshield styles in a matter of seconds, without having to turn one screw! 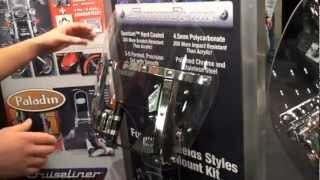 How Do SwitchBlade Windshields and Mount Kits Fit Your Bike? 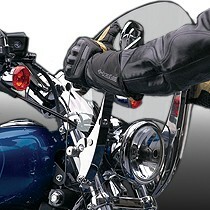 Each SwitchBlade Windshield and Mount Kit is model-specific. These are not "universal" fitments that work fine on some models and work poorly on others. When you order the mount kit and any SwitchBlade windshield for your model bike, you can be sure it will fit like it was custom made for your bike – because it was! On and Off in Less Than Five Seconds... Without Tools! This fork-mount hardware system secures your windshield with bulldog tenacity but looks attractive and refined when the shield is off. Innovative stainless steel cushion wheel spools turn and flex, allowing the shield to lock into place with a reassuring "pop". We design and engineer Quick Release Mount Kits directly on each model motorcycle to ensure perfect fit and function. Mount Kits are available for almost every model bike. SwitchBlade® Quick Release Mount Kits are sold separately. 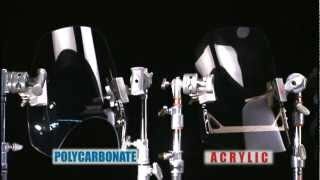 High quality chrome plating and polished stainless steel will keep your SwitchBlade Windshield looking good season after season. Our thick, sturdy polycarbonate windshields are three-dimensionally formed, precision drilled and cut, and feature smooth beveled edges. Best of all, SwitchBlade Windshields feature our exclusive Quantum® hardcoating for the ultimate in scratch resistance! There is no better windshield than this!